Contact our friendly staff to book an in-home consultation. Korlok from Karndean is a brand new rigid core flooring collection – taking all of the best elements of a rigid core floor, but with the beautiful handcrafted designs and quality you’d expect from Karndean. Korlok is quiet underfoot, and its pre-attached acoustic foam backing makes it perfect if you’re looking to reduce noise transfer. Unlike laminate and wood flooring, Korlok is completely waterproof, making it a great choice for rooms in the home prone to spills or splashes. Need flooring in a hurry? Korlok can be laid over most hard floors, and is quick and easy to install without the need for adhesive. With a single action installation method, Korlok’s 5G mechanism means the fitter can quickly click and lock planks together – with the reassuring snap of the click so you know the floor is securely locked into place. With Korlok you can transform the look of your room quickly and easily, meaning less disruption for installation and you can keep the noise from the room above upstairs – where it belongs. From design to functionality, everything clicks with Korlok. 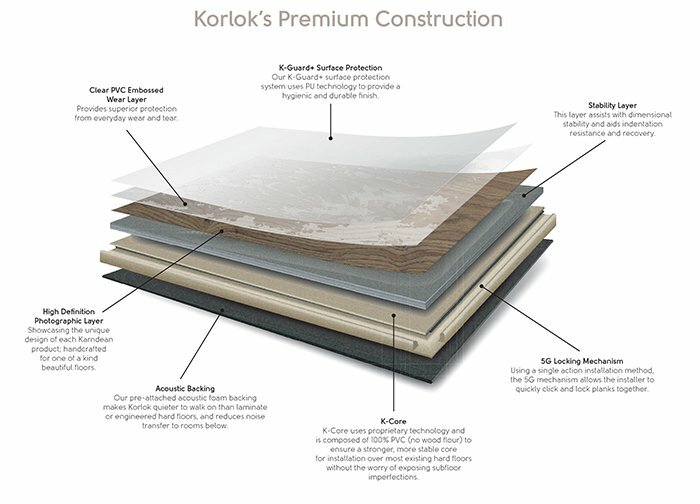 Besides the unique benefits of its K-Core technology, acoustic backing and click mechanism, Korlok also comes with the many other benefits of all Karndean Design flooring products including a lifetime guarantee. Visit our showroom today and speak to our sales team about this amazing product.